Bhaskar Rao, IGP (Northern Range), Belgaum who was earlier at the transport department then had made suggestions that Volvo buses are not safe with regards to the emergency exit mechanism. Today Bhaskar Rao inspected the Volvo buses and found the same thing and the issue of safety was not taken prominently he said. The Emergency exit that has to be mentioned was not mentioned in many cases and also the gap between two seats was less than prescribed. Also the speed governors were not working. 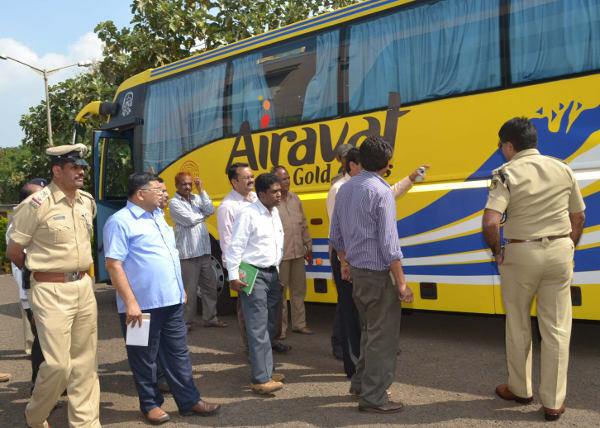 In an interview to the TOI earlier this week, and Referring to last week’s accident in which 45 passengers were burnt alive in Andhra Pradesh, Rao said he corresponded on safety issues with Volvo headquarters in Sweden and Volvo India authorities, soon after a Volvo bus-truck collision left 14 dead in Kolar in 2008. Also in some Volvo buses each seat has been affixed with an hammer which can be used in case of emergency to break open the windows. RTO cheif Hemadri and other officials were also present during the inspection. Very true, these days travelling with Volvo is not that comfortable. If you happen to sit in last row of this bus we can realized that there is no place left even to move our legs, ever things are squeezed to put in more passengers. Safety is not the top priority for these days buses/transporter, they are just only concerned about increasing price on the festivals, which is a big loot done by all bus transporter. Not sure how heights these transporter will go to accompany more passengers in a single bus.